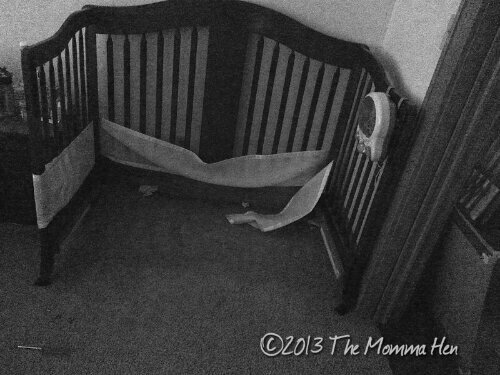 For the first time in eight years, there will be no crib in our living quarters. Seems like yesterday we were getting it — and everything else — ready for Hatchling #1 who, to our great joy and surprise was followed by #2 and #3. All the boxes of gear. One of these items actually made it through all three hatchlings. Can you guess which one? Oooohhhhh, the Diaper Champ. Better than the Diaper Genie because it used regular garbage bags. No better than any similar product because they all reek after a couple days worth of diapers. But notice the bottle of wine mysteriously coming out of the top of the box. The room, all ready and waiting about a bazillion days earlier than necessary. And there’s our beloved Greyhound. Me role playing. There’s no baby in that stroller, but that didn’t stop me from pushing the stroller around as soon as we got it. Doesn’t every new mom fantasize about casually strolling outside with their serene new baby? No one tells you about the bumps, hungry screams and diaper blowouts that happen, too. I thought the picture of the sleeping baby on the crib mattress (meticulously and tirelessly researched before buying this brand) was really funny. Even more so when I found out babies don’t really sleep on crib mattresses. They prefer Mommy’s chest or bed. At least mine did. I have no idea why he’s so excited about a bag of onesies. Okay, maybe I do.